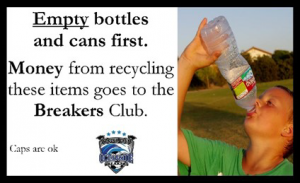 Almost every weekend in Oceanside, California, a dedicated volunteer collects hundreds of plastic bottles and aluminum cans from recycle bins at soccer fields, transports them to a local recycling center and donates beverage container CA Redemption Value (CRV) proceeds they receive to the Soccer Club of Oceanside (SCO). This generates an extra source of revenue for SCO youth soccer teams. 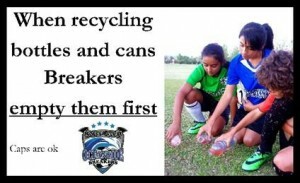 When SCO discovered that 14% of CRV bottles and cans disposed at soccer fields were ending up in garbage cans instead of recycling bins, Action Research offered to assist the club in reversing this trend. 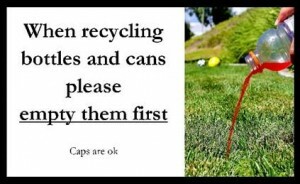 Action Research staff replaced the standard “chasing arrow” symbol and “RECYCLABLES ONLY” message on recycle bins at Oceanside soccer fields with a series of experimental messages that encouraged disposers to empty CRV beverage containers and place them in recycle bins. Each message appeared on recycling bins at Oceanside soccer fields for a two-week interval in August/September. Behavior change was measured by counting the number of disposed CRV items in paired recycling and trash bins two weeks prior to and during placement of the experimental messages. 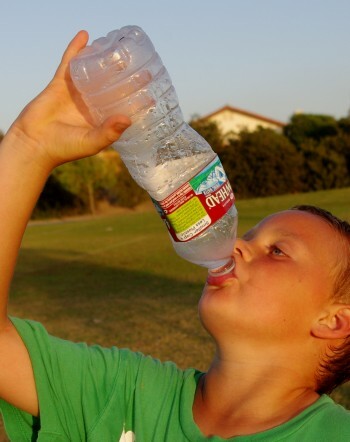 The Action Research messages had a significant impact on disposal behavior. The number of CRV beverage containers placed in trash bins was cut in half and the number of containers in recycling bins containing liquid dropped from 22% to 17%.